Sheers are window coverings that often hang behind traditional style curtains. Sheers can provide a little more privacy while still allowing light to enter the room. One of the problems people have with sheers is that they can be too long and need to be shortened. Sheer fabrics can be difficult to work with, even if you are simply hemming them. Sheer curtains are an elegant addition to any window in your home. If your sheers are much longer than necessary, cut off some of the length. Hemming sheers with a lot of excess fabric is bulky and does not look attractive. 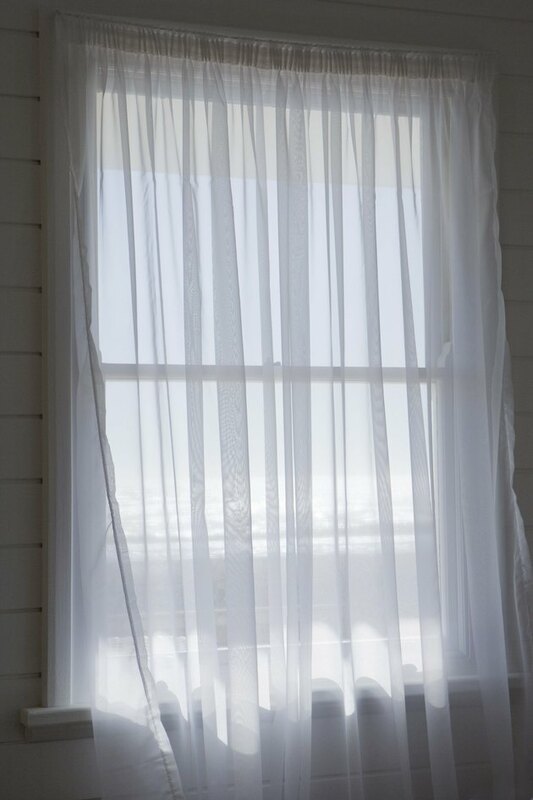 To trim your sheers, hang them up at the window to get the desired length. While the sheers are hanging, trim away the excess fabric, leaving an extra inch for turning under. Alternately, hang them, mark the desired length with pins or chalk, and remove the curtains. Cut off the excess while working on a flat surface. Depending on the type of fabric your sheers are, you may be able to hem them by machine. Once you trim off the excess fabric, remove the sheers from the rod. Turn the fabric under ½ inch and again another ½ inch to hide the raw edges. Use plenty of pins to hold the fabric in place, especially if the sheer fabric is slippery. Use a longer stitch than normal, but not as long as a gathering stitch, to hem your sheers by machine. If the fabric your sheers are made from has a lot of holes, such as lace, you may have to hem the curtains by hand. Trim the excess fabric, turn under the edges and use a needle and thread to sew a hem. Serging is another way to hem your sheers. Using a serging stitch on a sewing machine leaves a satin stitch at the bottom of the fabric, without the excess fabric that you get when you turn the fabric under. If you own a serger sewing machine, this will trim the fabric and do the stitching at the same time. If you do not own a serger, trim off the excess fabric and set your sewing machine up to stitch a satin stitch (check with your owner's manual) along the bottom edge of the fabric. Hem tape is another option when sewing a hem to shorten sheer curtains. Trim the sheer to about ½ inch longer than your desired finished length. Attach the hem tape to the front of the sheer and turn it to the back, creating a neat hem on the front of the sheer. The hem tape works well on sheer fabric that is slippery or is difficult to work with. Ruth O'Neil has been a freelance writer for almost 20 years. She has published hundreds of articles and stories in dozens of publications including "Parentlife," "CBA Retailers and Resources," "Lookout" and "Standard." She has also worked with a publishing company editing and preparing manuscripts for publication.